For Trevor's seventh birthday, we bought him his own set of golf clubs. (You can see the layout about that here.) 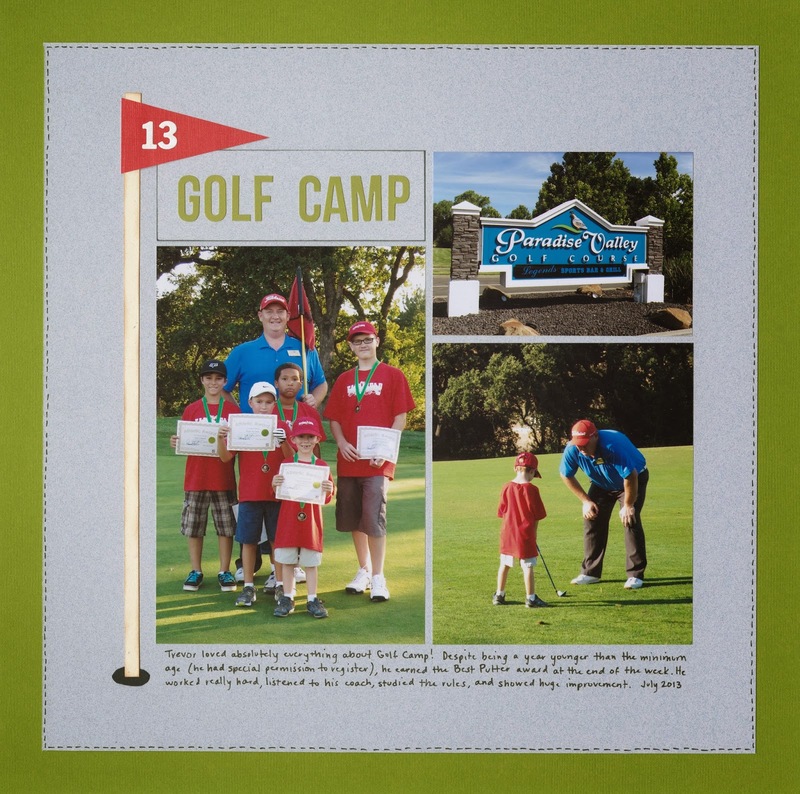 He'd been interested in golf for a long time, but his interest skyrocked in first grade when he became friends with a boy who plays competitively and is very highly ranked for his age group. That friend's dad encouraged me to sign Trevor up for a golf camp at our local course. One problem: Trevor was a year younger than the minimum age for the camp. Because it never hurts to ask, Trevor and I went in to speak with the instructor to ask if it was possible for Trevor to enroll. The instructor sat down with Trevor to get to know him and to explain the behavior expectations and physical requirements. After the conversation, he gave me the OK to enroll Trevor. Hurray! Trevor loved everything about the camp. Trevor struggled with hitting the ball any distance, but quickly became an excellent putter. The camp culminated with the kids playing a 'best ball' game in the evening with parents caddying. Trevor's ball never went the farthest (not even close), but once they were on the green, he almost always aced his putts. (They say it's all in the short game, right?) Most importantly, Trevor showed huge improvement and had a lot of fun. Trevor can't wait to do Golf Camp again this summer. How fun that he got to go!!!!! I loveeeee your page!! LOVING the colors and the flag!!!!!! Perfect page. LOVE the big flag at the tee. Super cute. What a great experience for Trevor!